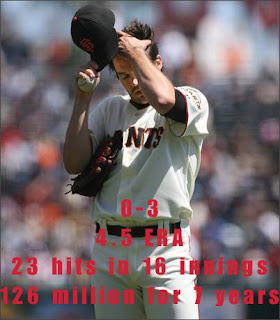 So...that Barry Zito guy is really working out for San Francisco, huh?? Why is everyone complaining about muddy football fields. The first thing I heard when the NFL schedule came out and saw that another game was in London, was "I hope the field is better this time and not so muddy. Hey...everybody...this is football. Not golf. Mud is part of the damn game. When did we get so prissy? Curt Schilling says the Yankees are not an option for his upcoming free agency. Awww, shucks. Over the off-season, Prince Fielder decided to become a vegetarian. And since he's batting a mere .222 with no HRs, Brewer fans are starting a "Hey Prince. Have a cheeseburger!" chant during Brewer games. It's a little early to start worrying, bu he does have more strikeouts (8) than RBIs(6). OK, maybe a turkeyburger? 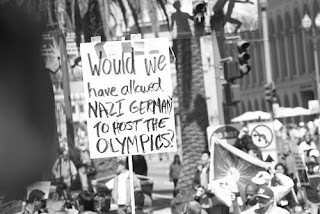 And lastly the picture to your right was held to protest the Bejing Olympics. Now, the protester is right to protest human rights violations in China—they are numerous and awful—but dude....read a frickin' book please. Jessie Owens? Ring a bell? They should still hang on to Harrison. If they do draft another WR, who better to mentor the guy? Of course, he could retire and stay on as a consultant or WR coach. Can you imagine his lectures? "Now pay close attention, cause this is how I used to get open EVERY TIME THE BALL WAS SNAPPED." I am with you - prissy indeed! That is why those of us who like watching REAL MEN PLAY SPORTS watch soccer (the REAL footie), or Aussie Rules Football: Mud, blood, and NO BLEEDING PADS! In some respects, American athletes are nothing but big pussies - the only American football team you can respect is the Green Bay Packers - still playing OUTSIDE after all these years!! Leo, Boar, Female, waaaaaay older than you!